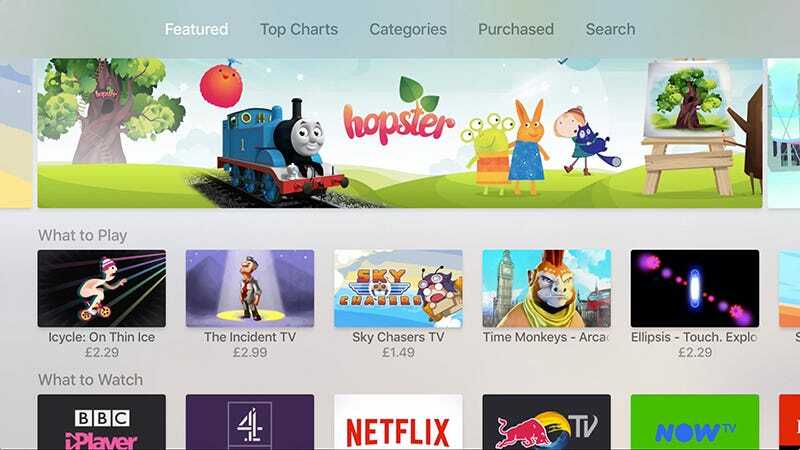 Last September Tim Cook unveiled the fourth-generation Apple TV and told us: “The future of television is apps.” The jury’s still out on that one, but in the eight months since then we’ve seen a ton of tvOS-compatible apps hit the App Store. Here are five that we think are perfectly made for enjoying on a big screen. Obviously your television screen is best suited for videos, but rather than just listing Netflix, Hulu, YouTube, HBO Go and so on, we’ve tried to pick from a variety of categories so there’s something for everyone. Remember any app purchases you’ve already made on iOS apply to the Apple TV too. If you don’t have time to make it to the gym then Streaks Workout makes full use of the Apple TV’s extra screen space to bring exercise sessions right into your living room. There are different exercises to pick from that don’t require any additional equipment. Streaks Workout then takes on the job of keeping your routines varied and organized, so you can look back on past weeks and months and see how you’re doing (the name of the app comes from the idea of keeping your streak going to improve motivation). The Apple TV app doesn’t technically do anything different to the one you can get for your iPhone, but of course if you’re halfway through a series of bicycle crunches then it’s much easier to keep an eye on the TV screen than it is to prop your iPhone up somewhere. A lot of developers will simply adapt their mobile apps for a bigger screen, but Storehouse actually does something different. By using the Apple TV app together with the iOS app, it’s possible to build up a collage of photos and videos on your television’s display. What makes it work as well as it does is the sense of collaboration, because anyone with an iPhone can get involved (it may not work so well if all your friends are on Android). Pictures and clips can be taken there and then or loaded from the Camera Roll. It’s a perfect alternative to the Apple TV’s native photo capabilities, because you don’t necessarily want every photo you’ve ever taken to be displayed for the world to see—and Storehouse manages to strike the right balance between simplicity and interaction. Maybe your Apple TV isn’t installed in the living room, maybe it’s in the kitchen—and if that’s the case then the Kitchen Stories app is well worth a download. The app is beautifully laid out and packed with all kinds of recipes, with new ones added every week. The photos and videos in Kitchen Stories look better than ever when passed through the Apple TV and of course the bigger the display, the easier it is to follow instructions for a winning garlic sauce or a homemade sponge cake. For the most part the app sticks to the basics for its tutorials and recipes—if you don’t know how to chop an onion, this is for you—but there’s enough variety here to interest cooks of all ages and experience levels, and there’s no need to log in or register to get started. There are plenty of good games out there now for the Apple TV, from the Wii-esque Beat Sports to the multiplayer-enabled Crossy Road. However, for this list we’re going to pick Alto’s Adventure, which looks even more gorgeous when played up on a big screen. You may well have come across this “endless snowboarding odyssey” before, as it’s been out for a while on both iOS and Android, but it translates very well to the Apple TV interface and the Siri Remote makes controlling your boarders even more intuitive. This is no ordinary endless runner (or snowboarder): you have to navigate changing weather conditions, rocks, elders, birds, llamas, chasms and more, while the different level challenges and range of power-ups keep the gameplay interesting. If you want to get your non-iTunes media up on the Apple TV then Plex is just about the best way of going about it. It’s easy to connect to: you just open a specific URL on the computer where your media library lives, type in a PIN code, and you’re ready to go. We’ve written before about how Plex can get all of your media in one place and recent improvements to the music and photo components make it much more of an all-rounder. You can watch on multiple devices and pick up where you left off on the Apple TV. Everything is designed to suit the Apple TV’s native UI and getting between your movies and shows is a breeze—you can use Plex’s mobile apps as remotes for the Apple TV if you want. For an alternative (and just as excellent) media player, try VLC for Apple TV.